At Allis Roller, our welding professionals and engineers continually look for new ways to drive down costs for our customers and increase the accuracy of our complex machined parts. Bringing in top-of-the-line equipment is one of the ways we accomplish that. With the addition of the new Miller/Panasonic Robotic Welder, here’s what our prospective and existing customers can expect from the now upgraded welding services available at Allis Roller. What Is the Miller Robotic Welder? 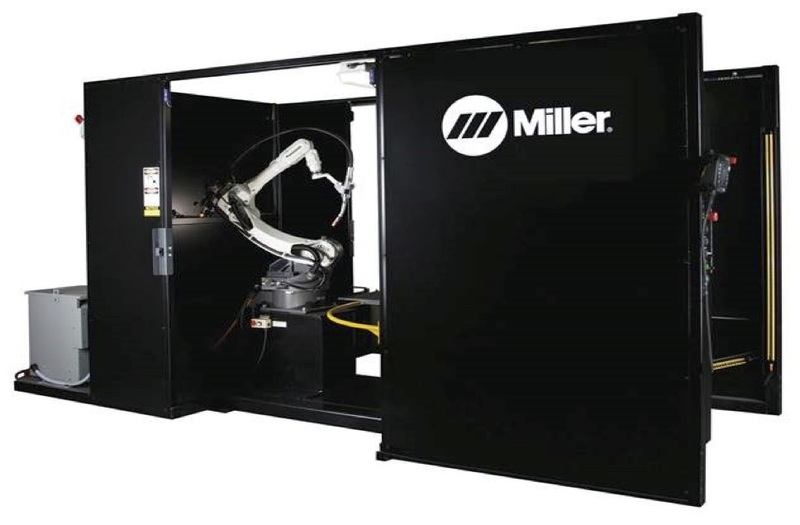 A Miller Robotic Welder is a cutting-edge welding machine that enables volume welding work to be accomplished by a single technician using rotating fixture cluster technology. The Miller can weld multiple parts in sequence with impeccable accuracy. On its two welding stations, the operator can load one or more parts onto a fixture. The fixture table then rotates 180 degrees for the robot to begin the welding cycle. On the other side of the circular fixture table, the operator can simultaneously load new parts onto the opposite fixture, allowing for a fluid and continuous loading and welding process. Additionally, there may be up to three parts loaded onto one fixture cluster, meaning up to six parts total can be processed at once by the Miller/Panasonic. With the addition of the Miller Robotic Welder in particular, we can assure our customers that steel and aluminum welding work remains at the core of our expertise at Allis Roller. Just like our Jetline welder enhances roller production, the Miller Welder increases our ability to fulfill large complex welding projects, keeping your business moving faster with a lower cost. With robotic technology, Allis Roller can expedite the production of large complex parts orders while increasing both the accuracy and quality of welds. 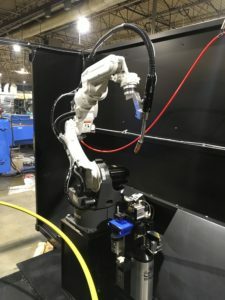 Generally speaking, robotic welding has the advantage of providing a consistent high quality weld at a 5 to 15% higher throughput than what would be possible with human hands alone. For example, Allis Roller’s Jetline Automated Welder has the ability to exactly control pre-heat and welding parameters, making the weld process consistent from weld joint to weld joint. With this high level of quality and accuracy, the Jetline Automated Welder is capable of welding over 40,000 rollers per year, and a theoretically unlimited number of weld joints on a single roller. The speed and efficiency of robotic welding work also allows our manual welders to focus on other smaller orders during a weld cycle performed by a robot, which enhances our operational efficiency. This benefit shortens lead times for a variety of welding jobs processed simultaneously, and allows us to pass on any additional cost savings to the customer. At Allis Roller, our engineers are experts at determining the best welding process and fixturing for a part, regardless of whether that part requires automated or manual welding. By defining specialized and custom manufactured weld positioning, fixturing, and tooling, and occasionally combining that custom work with automated or robotic welding, we save the customer money and assure high quality parts. Incorporating automation like the Miller/Panasonic or the Jetline into our operation doesn’t cut corners. Rather, it keeps the production process lean, while maximizing and even improving quality control overall. For more information on how you can benefit from our latest addition to the Allis Roller welding arsenal, connect with one of our complex machined parts experts via the Contact page.